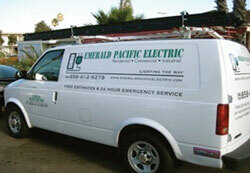 Emerald Pacific Electric is a full service Electrical Company performing work in San Diego and the surrounding areas. With over 30 years combined electrical experience we are confident that we can carry out your next electrical project. We specialize in service upgrades, older house rewiring, renovations, and tenant improvements. We provide a team that has the knowledge and ability to get the job done. • Work with clients, not against them. • Resolve problems, not create them. • Do the job the right way, not the easy way. • Be fair and honest. • Develop a lasting relationship with our clients.